I'm so sorry that I've been lacking in blog posts recently, I feel like I haven't had a minute. You know those times when you wish you were more organised with your blog posts (have some saved up front) yeah exactly! As they are my favourite brand for eyeshadows I decided to get some new one's as I hadn't purchased any in store for so long. I opted for the refill eyeshadows at £10.00 per shadow. 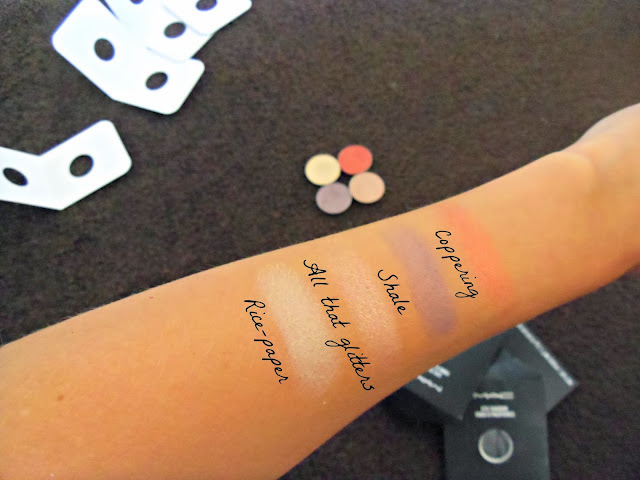 Rice-paper: is a really pale sandy/champagne colour that goes with near enough every eyeshadow colour that you probably own. I like to pair mine up with brown or plum shades. I use Rice-paper as a base on my eye lid or as a highlighter in the inner corner of my eyes or under my brow bone for a subtle highlighting effect. It also has a nice yellow tone frost finish. I noticed that one of my favourite YouTubers were using this in one of her vintage eye make-up tutorials so I had to get it straight away and I haven't put it down since. All that glitters: this has got to be my favourite eyeshadow at the moment, it's so, so pretty. I have a feeling that it's going to be my 'go to' eyeshadow for quite some time too as it looks amazing, even when its been applied quickly first thing in a morning. It is a veluxe pearl finish so it is very shimmery. I would describe this as a peachy/pinky/bronzey colour. Shale: is described by MAC as a mauve plum with subtle shimmer with a satin finish and I couldn't agree with them more. 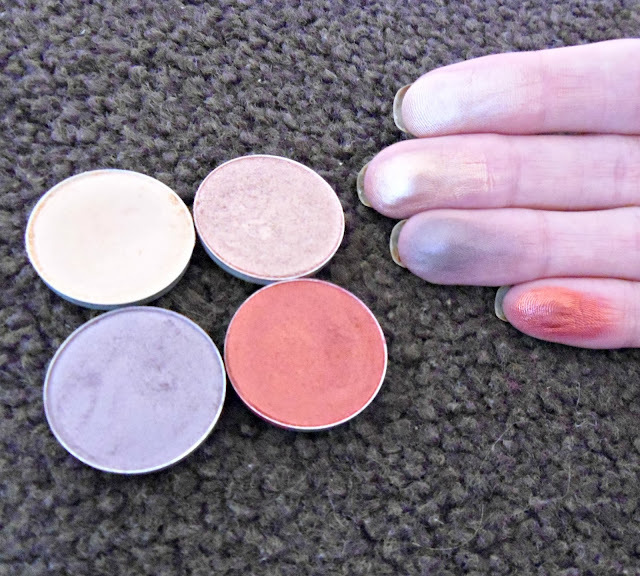 I find that it makes a really pretty smoky eye with Satin Taupe (one of my old time favourite MAC eyeshadows) or even with a light champagne colour on the crease if you want to keep it light. Coppering: I just keep dipping my finger into the pan with this one. The shade is just beautiful! The lovely lady in the store helped me pick this one out as it's not something I would ever reach out for as I tend to stick to my neutral's, always! It's a orangey/red/copper shade that would look nice with gold's or browns. It works as a lid, v and crease shade for me and if you have blue eyes they really do recommend this for you as it will make your eyes pop! What's your favourite MAC eyeshadow shade? I'm always looking for new ones to try out, but it's hard to get a good match with my green eyes sometimes as they have blue and yellow in them. I also had a look at the new Rihanna range... yuck! is it just me that think's the packaging is super tacky? put me off big time. I would also like to say that I have revealed the winner of my Soap & Glory giveaway. such a lovely group of colours! 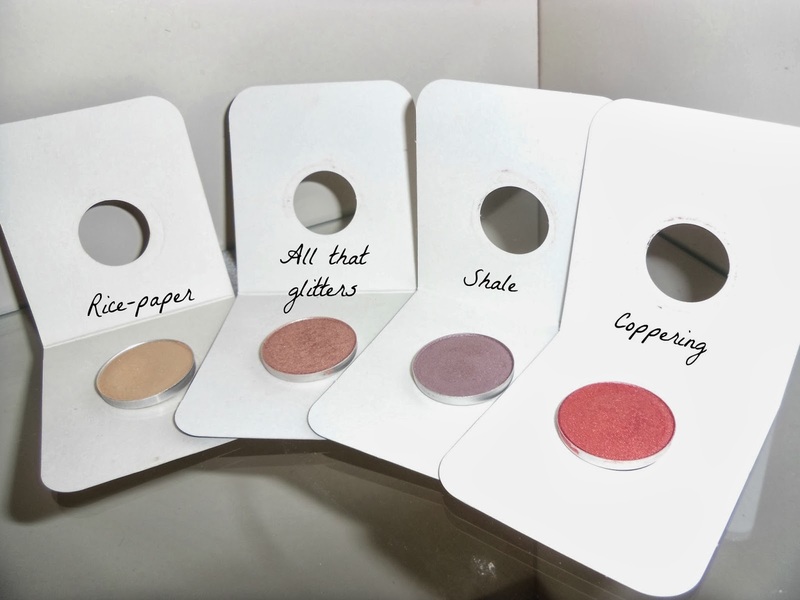 I don't own any mac eyeshadows but I might have to go look at coppering as that just screams my name! ahh I've just 'googled' that colour and it looks amazing in swatches, so much yellower in the pan isn't it? :) might have to purchase this one next. I must have amazing taste then haha! Ahh all soooo pretty & great shades for a/w. Coppering look gorgeous! finally back to blogging, woo haha! the vacation was lovely thank you hunny. I had a really nice time & it was good to take a break from everything, but I was glad to be back with my little doggies :) mac eyeshadows are unreal and I couldn't compare them to any other, I love them! fingers crossed for you mrs, I need some mac lipsticks, but not sure what to pick out. it was lovely thank you and much needed haha! i'm glad I picked this one up as i'd of never ever ever of picked it off their website, looks so much better on or swatched. The All That Glitters shade looks amazing!!!! All That Glitters is one that I keep meaning to pick up! Great picks!! All that glitters is still a shadow I need to pick up. It's such a gorgeous colour!